The musical phenomena presented here represent not a genre, but a musical scene. Will Straw’s characterization — “scene is usefully flexible, requiring of those who use [it] no more than that they observe a hazy coherence between sets of practices or affinities” (2002: 248) — enables one to get away from fixed unities of class or subculture and evokes both the “cozy intimacy of community and the fluid cosmopolitanism of urban life.” His more general definitions of scene (he gives several) apply to the scene that I am discussing. It is both “all the places and activities which surround and nourish a particular cultural preference” and “all the broader and more geographically dispersed phenomena of which … these preferences are local examples” (2002: 249). With the development of institutions and support personnel dedicated or closely linked to this music it is also coming to resemble the networks which sociologist Howard Becker dubbed art worlds (1982, see Brinner in progress for detailed discussion). • melodic resources derived from or reminiscent of Arabo-Turkish maqam. Some groups also draw on Persian dastgah and Hindustani raga. • rhythmic motivation and organization based on the patterns and sounds of hand drumming available on the spectrum that stretches from the Middle East through Iran to India. While some drummers might use a cymbal or two, most avoid the stick drumming on the trap set and its electronic derivatives that dominate popular music in Israel (as they do music around the Mediterranean and, increasingly, throughout the world). • a strong preference for acoustic instruments including, but not limited to, the ‘ud and ‘Oriental’ violin (referring to tuning, timbre, and playing idiom). • a corresponding prejudice against the synthesizers that characterize much of the Mediterranean pop that moved from the margins of Israeli public sphere to a problematic place near the center (and has been the focus of considerable scholarly attention ever since). Principled opposition to loops, samples, synthesizers and the like may be weakening: Call of the Mountain, a brand new album put together by two leading figures in this scene — Eyal Sela and Avshalom Farjun — makes extensive use of electronic samples in loops and other permutations. Beyond these commonalities, each group produces distinctive, compelling music that emerges from the interaction of a unique set of people and circumstances. As Richard Baumann has written, “the emergent quality of performance resides in the interplay between communicative resources, individual competence, and the goals of the participants” (1984: 38; note the importance placed on goals and competence). The phenomenon of emergence is particularly significant in the cases discussed here because there are no set genres or overall conventions for this music — although the new music is created by drawing on long-standing musical practices, it involves new mixtures of these resources. These musicians come from such different backgrounds with differing musical conceptions and resources that they must put significant effort into creating common ground and meeting somewhere in the middle. Each one brings at least one deeply situated musical competence to these collaborations (see Brinner 1995 for discussion of the development and deployment of musical competence). With few exceptions they come from professional careers looking for a new type of performance to add to or replace their musical specialization. Most of them — but, surprisingly, not all — also came with openness to learning other kinds of music from their colleagues. Bustan Abraham, exemplifies this phenomenon well. Members of the group contributed to their pioneering endeavor competences in various types of Arab and Turkish music, jazz, flamenco, funk and American vernacular styles of banjo and blues guitar. Individually, each of them has told me how much they learned from other members of the ensemble who were fluent in types of music that they themselves did not know. This is not to say that each one mastered the others’ competences. But they strove to learn enough to work together. Nor does this mean that they necessarily shed their previous standards and came to share aesthetic criteria. In one instance, a non-Arab member of the ensemble went into the studio and overdubbed a response or “enhancement” to an improvisation by one of the Arab musicians. When the latter heard it he rejected it as unsuited to the modal implications of his solo. We see here both a lack of full understanding and an unwillingness to relax or alter the standards of a particular style of music. But more often than not, the musicians have been willing to bend their music and stretch out toward one another. This tension between maintaining the standards of established musical practices and creating innovative combinations has driven the musicians to invest considerable time and effort in working out their music. The transfer of competence and the very nature of collaboration were substantially different in Alei Hazayit. Jamal taught Shoham everything she knows about Arabic music. The lessons were by example rather than through any kind of theoretical discourse, appropriately enough, considering that neither of them is in the least theoretical in orientation, often citing their intuitive understandings in our conversations. Jamal decided what Shoham was ready to learn and refused to teach her the longer, modally more complex songs before she was ready. The band’s first bass player, an immigrant Jewish jazz musician from France, brought expert knowledge of jazz to the band but knew little if anything about Arab music. His replacement, an Israeli Jew, had greater experience playing Arab or Arab-influenced music, but was clearly less competent in this area than the Palestinian members of the band. However, this was not as much of a hindrance as it would be for any other instrument since the bass has played a relatively restricted and untheorized role in most Arab music of the twentieth century. When it comes to the non-Arab repertoire performed by Alei Hazayit, the Arab members have had some learning to do, too, but they have done much less to adapt. None of them were used to thinking in harmonic terms before they joined the band and I would wager that most of them still are not, despite the chord progressions that underlie many of the songs that Shoham taught them. All in all, they continued to play much as they did when they interpreted an Arab song. Shoham did a fine job of assimilating the basic feel of Arab song through the expert modeling of Jamal, but she continued to draw on her Sephardic heritage of Ladino song for the core of her vocal expression. This is particularly apparent in her rhapsodic vocalises, performed where an Arab singer might improvise on the maqam and the text — with rather different results. Compared to the members of Alei Hazayit, the musicians of Bustan Abraham possessed a far more heterogeneous assortment of competences as well as a higher level of formal training in their respective areas. They enjoyed extensive cross-fertilization of ideas. Although mutual influences stopped short of transforming Taiseer Elias into a competent performer of jazz or Amir Milstein into an Arab flutist, they learned a lot and changed their compositional and improvisational styles during the period of working together. (The exception to this was Zohar Fresco, the percussionist of the band, who became a highly qualified drummer for Arab music largely through his association with Elias and Dakwar.) But after the dissolution of the band several of the members individually told me that there had also been an increasing tendency to pull in different directions, certain members really wanting to working primarily or solely in what they termed an ‘Eastern’ aesthetic, while others wanted to give greater emphasis to ‘Western’ aspects, particularly more complex harmonic and contrapuntal devices. Since Yair Dalal strives to play mainly within a Middle Eastern stylistic field in any case, he has shared a considerable amount of musical knowledge with his Arab musical partners. He lived alongside Bedouin in Israel’s southern Negev and in the Sinai long before he worked with the members of the Azazme tribe to record the CD Azazme, absorbing this musical language and repertoire to the point that it was not a big stretch for him to perform with them. His long-term efforts at bridging musical differences have been directed toward his work with his band Al Ol in which there are no Arab members and the ‘other’ music is Hindustani, not Arab or Euro-American. The collaborations with Arabs are a sideline for Dalal, not the principal endeavor as in Bustan Abraham or, even more so, Alei Hazayit. These comparisons bring us back to the musical asymmetry mentioned at the outset. With few exceptions — Yair Dalal being one of them — Israeli Jewish musicians involved in such collaborative musical endeavors do not work under the weight of tradition and convention that Arab musicians do. Neither do they have that same weight of authority as a foundation. Though they may have achieved high, professional, levels of competence in European art music and/or jazz, they have tended not to bring as much of the aesthetic and theoretical ‘baggage’ of these musics to their collaborations. Amir Milstein, the flute player in Bustan Abraham, summed up his experience and that of many other Israeli Jewish musicians when he pointed to the competitiveness of the Israeli musical world as a stimulus for becoming a jack of all trades (he used the Hebrew slang kolboinik; p.c., June 2003). Dalal abandoned this avenue when he decided to focus on Middle Eastern music, and particularly on Iraqi repertoire. As the old Iraqi musicians who immigrated to Israel in the 1950s retire and die, he has appropriated the mantle of authority for the Iraqi Jewish repertoire and the broader Iraqi maqam repertoire that he learned from this older generation (5). When a band endeavors to draw on a number of musical practices in which only some members are expert there is also a crucial element of vulnerability: having established their credentials in one or more types of music they are exposing themselves to the possibility of failure by attempting to reach beyond those musical practices, into areas where their band mates are more competent and comfortable than they are. 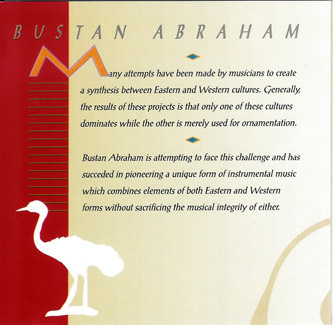 I believe that it is the presence of “native” mastery in several different types of music (alongside sheer virtuosity) that ensured perceptions of authority and authenticity among Bustan Abraham’s audience. The contrasts in dealing with differential competence and authority exhibited by these three groups of musicians are directly linked to different modes of interaction within the bands. Yair Dalal is the undisputed leader in the collaborations that appear under his name (he does perform as a side man in other people’s recordings such as Eyal Sela’s Darma). Bustan Abraham was the most egalitarian of these ensembles. Farjun, as founder and arranger of tours, had little more “power” than any other member of the group and frequently had his suggestions vetoed or modified. In its early years the band did a lot of collective composition, crediting each piece to its originator, but working long and hard to build compositions from the raw ideas that individuals brought in. This changed as they became more experienced and busier with professional and family lives, but the decision-making process remained highly democratic, with extensive, candid discussion. In conversations over the years individual members of the band, both Jews and Christian Arabs, repeatedly expressed to me the feeling that ethnic, religious, or national distinctions were completely beside the point within the group. In fact, viewed from any other perspective, these men have far more in common than not. They are all educated and highly polished musicians of roughly the same generation. But society at large does not permit one to ignore these differences which arose repeatedly in interviews, frustrating the musicians who saw questions of identity and politics as peripheral issues drawing attention away from their music. Members of Alei Hazayit also had extensive discussions of their repertoire and its arrangement for performance. But here the dialog around creative decisions involved two or, at most, three voices: Shoham, Jamal, and the violinist, Omar Keinani. The other members of the band were decidedly less involved in decisions and other forms of leadership in the rehearsals which I observed. Tensions were inherent to this three-headed interactive network, with conflicting musical interpretations playing out alongside a tangle of social issues. But the rehearsals were also marked by the obvious pleasure that the musicians gained from working together. There was an excitement that derived from the novelty of their endeavor. They did not talk about changing the world, but about getting away from the clich�s and constraints of the music that they were forced to play most of the time in order to make a living. Beyond that, they simply enjoyed each other’s company. As one of them said: “When we don’t meet we feel that something is missing.” The pervasive playfulness of their interaction was evident at one rehearsal where the young ‘ud player Fu’ad arrived late. Shoham opened the door and said “Wihyat ‘Inayya” (by my eyes), the title of a love song by Sabah Fakhri that they were rehearsing. Jamal picked up on that and began to drum the introduction, Shoham and the others joined in, making Fu’ad welcome and putting him on the spot at the same time. Much of the playfulness emanated from Jamal’s presence. A compulsive joker and slapstick comedian, he can make almost anyone laugh. This is a survival mechanism that has helped him maneuver his way through many tight situations involving either Israeli military or Arab critics. It is also a tool which he deploys to resolve difficulties of musical interaction. The combination of songs that Shoham and Jamal selected for Alei Hazayit was unusual in itself and created links to both of their constituencies. The musicians exercised creativity at the level of arrangement, embellishment, and improvisatory solos, rather than in the composition of discrete pieces (as the members of Bustan Abraham did). The starting point for the interpretation of all the songs was the framework provided by the conventions of Arab musical performance practice. This was normal for the Arab songs, of course, but refreshingly new for the other songs. It can also be seen as a radical undermining of the communal Jewish ethos, the “Israeliness” developed through precisely these “Songs of the land of Israel” (shirei eretz yisrael) (6). In addition to the overall “Arab” sound of the ensemble Shoham added vocal touches that are not typical of Arab singing, vocalise-like improvisations that are probably best understood as an extension of the Ladino ballads that are her core repertoire, as we heard in the example from “Erev Shel Shoshanim” cited above. From its first album onward Bustan Abraham promised a new, uniquely Israeli musical language. This was to be an organically unified means of expression, not some hybrid fusion. Eleven years later, Miguel Herstein was as explicit about creating a new musical language as those original liner notes promised. He rejected the notion that Bustan’s music was fusion or a hybrid because he felt that there was an integration of elements to the point that they constituted a new whole (p.c. January 2002). Some of the band’s earliest efforts appear to fall short of that ideal, but over time they succeeded in composing and performing pieces that were such seamless confluences of ideas that it is easy not to think about the sources or component parts, accepting the whole as an expression of a new musical language. Yet the improvisational and compositional styles of flautist Amir Milstein and violinist Nassim Dakwar or Taiseer Elias — to take extreme cases — still flowed from radically different sources. This desire to create a new language is not shared by all. Shoham was as explicit about her work with Alei Hazayit as Miguel was regarding Bustan Abraham: while she endeavored to make the Arab songs sound Arab she did not do that to the Israeli ones. She expressed a distaste for people who sing Hebrew as if it were a different language — French or English or Arabic — and sought to differentiate herself from Zehava Ben or Margalit Tsan‘ani, two of the stars of musika mizrahit. She wanted to keep the rest of the band ‘Arab’ in conception and sound in order to preserve the basic character of the Arab music and to add an Arab touch to the Hebrew songs (p.c. January 1997).